We’d love your help. Let us know what’s wrong with this preview of Love? 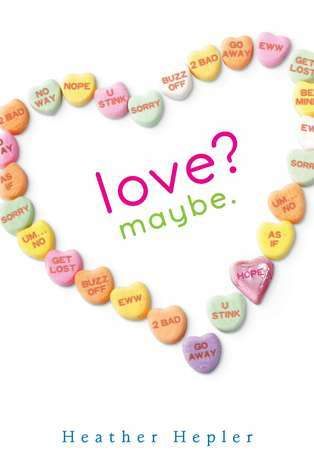 Maybe by Heather Hepler. To ask other readers questions about Love? Maybe, please sign up. Is this book too mature for a 5th grader? Emma Drizski No its not to mature, there could be one and\or two things a 5th or younger wouldn't understand!! what is piper's last name? This review has been hidden because it contains spoilers. To view it, click here. Piper was born on Valentine's Day. She used to love the holiday and her birthday, but since the second divorces of her mother...not so much. She just doesn't believe that real love actually could exist. All she has to do is take a look at how her mother is still in love with her ex husband even though he has moved on and has another girlfriend. Or how about how one of her best friends who just got dumped by her boyfriend of the past year. If she still thinks love is possible she just needs to lo Piper was born on Valentine's Day. She used to love the holiday and her birthday, but since the second divorces of her mother...not so much. She just doesn't believe that real love actually could exist. All she has to do is take a look at how her mother is still in love with her ex husband even though he has moved on and has another girlfriend. Or how about how one of her best friends who just got dumped by her boyfriend of the past year. If she still thinks love is possible she just needs to look next door to see how awful the boy next door feels about the recent divorce of his parents. Even if there is some small hope for love, she can always look at her boss who is yet another single person who blindly believes in love. But Piper's friends don't want to give up on love. And they don't want Piper to either. So there is a plan for to get all three of them boyfriends in the next two weeks, before Valentine's Day. Piper does not want to go along with it but will if it makes her friends happy (especially the one who just got dumped). So she is doing all sorts of things she doesn't want to do, all in the name of love. To top it all off she is still trying to juggle swim meets, her job at the candy store (which is super busy just before Valentine's Day), watching her younger brother and sister (who are crazy hyper) while her mother is trying to support them with her floral business (which is even more busy since it is almost Valentine's Day). Then, to top it all off Piper starts to receive gifts from a secret admirer and starts to potentially date the main heartthrob of her school. Now she starts to wonder if there is such a thing as love and what does it really mean? Okay, I loved this book. And basically there are a few reasons why. Most of it has to do with the fact that I think this book really understands what my view of love is. And it also understands what my view of how a high school girl should act when in love. That being said, if you think you like my ideas of love and you like happy, Valentine's Day type love stories that are clean and stars a girl who doesn't really love chocolate...just go read it. If you need to hear more about why I like this book, read on. Only beware that I will have a few spoilers below! Okay. So here is the dirt as to why I like this book. She is in high school. She has been hurt by love before. She had two dads who walked out on her family. Life is hard. She knows that, but it is harder when you feel rejected. Also, when she first starts to date Ben (or any of the other guys mentioned that she dated before the story) she found that she thought they were "nice" but that they weren't "the one". Why weren't they Mr. Right? Because she didn't have enough to talk to them about. Because they didn't have enough in common. Because she thought there should be more to love than just that tingly feeling you look at someone you think is cute. I like that. When she does get together with Charlie the things that she admires about him are that he knows her (he knew that she would like a secret admirer gift that was a banana without any brown spots or a jar of peanut butter with a plastic spoon). And at the end when they end up together, she admits that she is still very scared of their new relationship. "I'm still scared...What if you leave?" Can't believe I finished this so fast! This book was such a cute read!! I loved it. It was cutely romantic but nothing super physical. The only physical things that happen are a few hugs and slow dancing. I recommend this book to anyone who's wanting to read a short story about confusing emotions and an oblivious love that came from a friendship. It was light and fluffy but not fun and romantic. It's not the kind of story that I'll be rereading when Happy Hearts' Day comes around - it was sorely lacking in the romance department. The main character was as interesting as a piece of cardboard. Her "secret admirer" wasn't much of a secret, rather, he was as transparent as formaldehyde. And the storyline was capital P-R-E-D-I-C-T-A-B-L-E.
A part of me died from the boredom. The author might've been trying to deliver an enlightening message h It was light and fluffy but not fun and romantic. It's not the kind of story that I'll be rereading when Happy Hearts' Day comes around - it was sorely lacking in the romance department. The main character was as interesting as a piece of cardboard. Her "secret admirer" wasn't much of a secret, rather, he was as transparent as formaldehyde. And the storyline was capital P-R-E-D-I-C-T-A-B-L-E. This review has been hidden because it contains spoilers. To view it, click here. It was a cute story but I think it was made for a younger audience. I mean I like wholesome books but this was too wholesome --- to the point of becoming boring. Piper Paisley is a typical love and romance cynic as the result of her mother's two failed relationship. It also doesn't help that her birthday is on Valentine's day and that she works at a chocolate shop. Her friends Claire and Jillian want to cure her of her indifference and set up a plan to use a love potion to get them dates. Predic It was a cute story but I think it was made for a younger audience. I mean I like wholesome books but this was too wholesome --- to the point of becoming boring. Predictably, Piper's crush on swimmer hottie Ben Donovan leads to nowhere because they don't have chemistry. But she continues to receive sweet tokens and treats from a secret admirer. It is revealed to be from her long time best friend Charlie. He gives her hope that love is possible in her life. Sigh. It was well-written and sweet. But I didn't like Piper very much. She was just so drab. Just because she didn't buy into love and Valentine's didn't mean she had to be boring. Her personality was flat and I wished she would've been more interesting. This was a decent read. I will admit it was nothing special. I can definitely see why the MC had trouble wanting to find love. With that kind of drama I wouldn't either. Thankfully by the end she was able to change her mind. Relatable and more enjoyable than I thought it would be. I was happily surprised! ;-) <3 More of a review to come. 3.5/5 stars. I liked it. Took me awhile to get into it and it was predictable but overall it was good. After reading The Cupcake Queen, I knew I had to get my hands on a copy of Heather Hepler’s new book. Lucky for me I didn’t have to wait long time. Piper doesn’t believe in love. Why would she? Two of the men in her life she trusted the most left her behind. First, her father, and then her stepfather. It doesn’t seem to help that her birthday is on Valentine’s Day either. Piper is a strong main character. She is kind, sweet, caring and sometimes stubborn. I loved Piper. She tak After reading The Cupcake Queen, I knew I had to get my hands on a copy of Heather Hepler’s new book. Lucky for me I didn’t have to wait long time. Piper is a strong main character. She is kind, sweet, caring and sometimes stubborn. I loved Piper. She takes care of her little brother and sister when her mother had to work. It was really refreshing to read about a girl who hates Valentine’s Day because most teenager girls love Valentine’s Day. Although Piper stood out for me, I loved all characters in this book. They have different personalities, and they are fun to read about. One of the characters I just loved, loved, loved is Charlie. He had a lot of things going on in his life but he wanted Piper to have the best time on her birthday and for her to believe in love again (because she used to believe in love when she was a kid before people in her life disappointed her). I was rooting for Piper and Charlie throughout the whole book, of course. They are cute together but they didn’t see it… well Charlie did, Piper didn’t. Love? Maybe is an easy, quick, fun read that you would read in summer or between dystopian/fantasy books. The best part about this book was that it was clean!! It is hard to find clean teen books. It was thought provoking in a lot of ways. The main character is having to deal with her mother's two divorces and her half brother and sister. I don't like how it implies you have to have a boyfriend but books like this also show a lot about how unhealthy a lot of teen relationships really are. a fast, cute read. the characters were diverse, Piper's younger siblings were fun, but I could have done with a little less of Piper's friend Jillian. pipers Birthday is on valentines Day. piper thinks that her birthday is not just on a romantic Day because she sees a lot of relation ships fall apart. she thinks that its like every other day normal and her best friend gets heart broken 2 weeks before valentines day and her other best friend has a plan and piper was nice and decided to go help her friend and not go and celebrate her birthday. Overall, this was a cute read that left me feeling happy at the end (which was why I rounded up instead of down). Piper, our heroine, is a super responsible 16? 17? (idk, we were never told how old she was or what grade she was in) year old. Her mom's a single mother who owns her own business, so a lot of the daily household and parenting duties (to her two young siblings) falls on her shoulders. After her father and stepfather both bailed on her life, she's cynical and jaded when it comes to love. Enter BFF on the scene with a Valentine's plan to get the three friends dates for the big day. It involves some (fake?) magic and some yummy treats. I didn't really get the unexplainable situations behind the whole "magic" situation. It was never touched on after the initial instances, and at the beginning of this book, I was actually wondering if this was supposed to be a paranormal YA. That was one of many things I just didn't get with this book. The intent was there, but the execution was just sort of...lacking. This was told in first person narration, and while I didn't mind Piper's voice, I also couldn't connect with her very much. The writing style felt choppy and scattered, and it seemed to focus on inconsequential details rather than the important things. (I don't need to know how she got from her bedroom to the car outside and every step in between). Rather than focusing on that, I wish we would've gotten more meat, and I really wish we would've been given some physical descriptions of the characters. We got none. There was also a whole lot of, "What was that look for?" and cut off sentences where characters didn't finish their thoughts...way too much secrecy and I didn't understand the purpose of it at all. For me, the story came together in the last 10% of the book. I wish we would've had more substance in the rest of the book, and I really wish we would've gotten more Charlie because what tiny little bit we saw of him was great and he had the potential to be super swoony. ...And I just reread what I wrote and realized I said "wish" about 47 times. That pretty much sums it up. I wished for a whole lot more than I got. If someone could recommend me a good young adult book without a slow beginning, I would love you. Before you read the review, let me just say that this was like a worse version of Sarah Dessen's This Lullaby. Go ahead and check that out. This book had a lot of potential. I didn't have too much of a problem with the plot, but I had some issues with the way it was written. I couldn't help but notice how choppy the sentences were. Almost all the sentences started with the same pronoun, and they swit If someone could recommend me a good young adult book without a slow beginning, I would love you. I didn't have too much of a problem with the plot, but I had some issues with the way it was written. I couldn't help but notice how choppy the sentences were. Almost all the sentences started with the same pronoun, and they switched to a different pronoun with a new paragraph. I sort of just started spacing out and counting how many times in a row they used "I". The book wasn't too descriptive either, so I could barely picture any of the scenes or characters. The only thing I could picture was a roof with clothes hangers, but that's it. If I hadn't seen the cover page, I wouldn't even have known what candies Piper had made. Not to mention this book was somewhat predictable (i.e. whole Charlie situation.) I didn't find myself yearning for Piper to do this, or hoping she's do this, or begging life that this wouldn't happen, because I just knew what was going to happen. Underrated. That is the adjective that I decided best fits this novel. It deserves way more attention than it has gotten. I really enjoyed this story! Mostly because I loved the main character. And all the supporting characters. And all the characters that were mentioned for about two seconds. Everything about this book is just really likable. It is one of those books that you feel good reading, that you want to keep reading because the environment is like a hug. Even when things aren't so perfe Underrated. That is the adjective that I decided best fits this novel. It deserves way more attention than it has gotten. I really enjoyed this story! Mostly because I loved the main character. And all the supporting characters. And all the characters that were mentioned for about two seconds. Everything about this book is just really likable. It is one of those books that you feel good reading, that you want to keep reading because the environment is like a hug. Even when things aren't so perfect for the characters, there is a warm, cozy place to retreat to. But seriously, this novel is a great read. Perfectly paced and enjoyable, but not fake. The story is light, sure, but there are also darker undertones of divorce, depression and overall heartbreak. I would definitely recommend it. Me gustaron mucho los personajes, aunque ya veía venir el final, de fácil lectura y entretenido. I was thrilled to find this book and to discover that it's totally clean!! No language; no intimate scenes; no violence. A great YA read, in my opinion. Piper has two younger half siblings and has the responsibility to care for them during the busy season of her mom's floral shop. She's also trying to hold down a job at a candy store, keep her grades up, perform well on the swim team, and focus on her friend's plan--a way for the three of them to ensure they have a valentine this year. Since Pipe I was thrilled to find this book and to discover that it's totally clean!! No language; no intimate scenes; no violence. A great YA read, in my opinion. Piper has two younger half siblings and has the responsibility to care for them during the busy season of her mom's floral shop. She's also trying to hold down a job at a candy store, keep her grades up, perform well on the swim team, and focus on her friend's plan--a way for the three of them to ensure they have a valentine this year. Since Piper's birthday happens to be on Valentine's Day, she's in for extra fun. Piper is quite cynical, since she has witnessed her mom's two failed marriages and many failed relationships all around her. But...she is in for quite a surprise. All in all I found the novel to be a cute, light-hearted story, which is sure to entrain readers, and hopefully bring a little hope to those who doubt the institution of love. Piper and her friends make Valentine’s an exciting and humorous adventure as they creatively pursue their “ideal” love interests. And while I’d have loved to see a more developed relationship between Piper and her father I thought the cast of characters was unique and totally love-able. Helper’s writing style is fast-paced All in all I found the novel to be a cute, light-hearted story, which is sure to entrain readers, and hopefully bring a little hope to those who doubt the institution of love. Piper and her friends make Valentine’s an exciting and humorous adventure as they creatively pursue their “ideal” love interests. And while I’d have loved to see a more developed relationship between Piper and her father I thought the cast of characters was unique and totally love-able. Helper’s writing style is fast-paced and engaging making for a fun afternoon of reading - I zipped through the story and totally fell for more than one of the girls’ “romantic interests”! "Valentine’s Day is just a capitalist scam, designed to make people currently in a relationship spend unnecessary money in a fruitless attempt to ensure undying love and devotion. For those of us not in a relationship, Valentine’s Day is simply added pressure to identify ourselves within the context of a romantic relationship, whipping us into a frenzy that only the presence of our soul mates can relieve." This should be perfect for Valentines Day, but sadly Valentines day already passed when I g "Valentine’s Day is just a capitalist scam, designed to make people currently in a relationship spend unnecessary money in a fruitless attempt to ensure undying love and devotion. For those of us not in a relationship, Valentine’s Day is simply added pressure to identify ourselves within the context of a romantic relationship, whipping us into a frenzy that only the presence of our soul mates can relieve." This should be perfect for Valentines Day, but sadly Valentines day already passed when I got a copy of this. This was a really sweet read. I can't imagine being born on Valentine's Day. I never cared for it much in high school either, but it was fun to follow Piper along as her birthday approached. I loved her cynicism and her wit. It made for a very fun read. I thought this had a great cast of characters. They all had their own personality, not blending together. I really liked Charlie. He was good with the little devils (they sure did seem like devils... even if they are just kids) and he even liked t This was a really sweet read. I can't imagine being born on Valentine's Day. I never cared for it much in high school either, but it was fun to follow Piper along as her birthday approached. I loved her cynicism and her wit. It made for a very fun read. If I can be honest, I found this book kind of boring. Too much description/inner dialogue and totally not enough interaction between Charlie and Piper. The whole thing was so anti-climatic. I kept reading thinking there was going to be some "big moment" or some "big revelation." Nope. Just really flat. I think this book is what driving across Nebraska is like. :) If you like "flat" books then this is the book for you! I will say though it was very clean and no swearing which is nice!! I read this book as a sequel to The cupcake queen but unlike some series this book had nothing to do with the other one. I enjoyed reading this because it didnt just focus on the main characters life it brought in a bunch of other characters. This book can be confusing at first but it overall is great. Love? Maybe by Heather Hepler is a wonderful novel. As the main character Piper and her friends go through some extremes so their not lonely on Valentine's Day they run into a few issues. How will they do it? How will they get a valentine in only a few weeks? In my opinion this book was very entertaining and shows the emotion of what it's like to have feelings for someone as a teenageer. I was born in Kalamazoo, Michigan, which I think is one of the cooler places to be born, because initially people think I’m being funny—like I’m saying I was born on the moon, but then they see I’m actually being serious. It feels like since then I’ve lived nearly everywhere (well, only in the US—which is a bummer because I want to travel so much). In high school, I was in band and honors society I was born in Kalamazoo, Michigan, which I think is one of the cooler places to be born, because initially people think I’m being funny—like I’m saying I was born on the moon, but then they see I’m actually being serious. It feels like since then I’ve lived nearly everywhere (well, only in the US—which is a bummer because I want to travel so much). In high school, I was in band and honors society and science club and worked on the school newspaper. All this in Texas where football was king and cheerleaders were the school royalty. When people ask me what I remember about middle school and high school, I stand there for several seconds not saying anything. This isn’t because I can’t remember anything, but because I remember too many things and I can’t figure out what to say out loud. “I think that love is like candy." "I don't like candy either," I say.